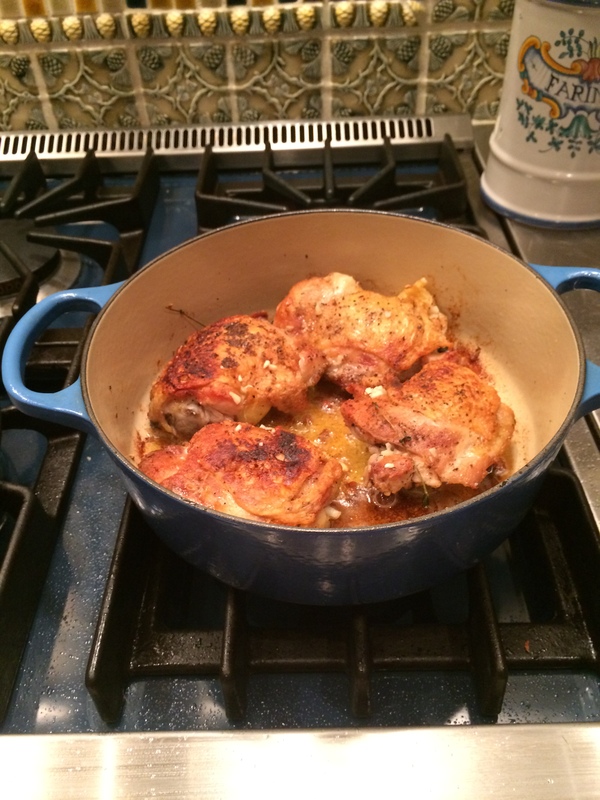 This was a delicious chicken dish that I made with chicken thighs but you can really make with thighs, drumsticks, and/or breasts. It’s a thin light sauce and if you’d like to thicken it up you can reduce the sauce by cooking over a high heat for several minutes, this usually will help to thicken it up by cooking it down. I did use 1/4 cup of heavy cream for the sauce , I don’t think it’s all that much spread out over the sauce, if you are unhappy about 1/4 cup use a little less. It was delightful and really light and nice despite the cream. This is what I did and the only suggestion I would make differently from what I did is to thinly slice the 2 small shallots, I chopped them and I think I would slice next time. 1 – 3 lbs. 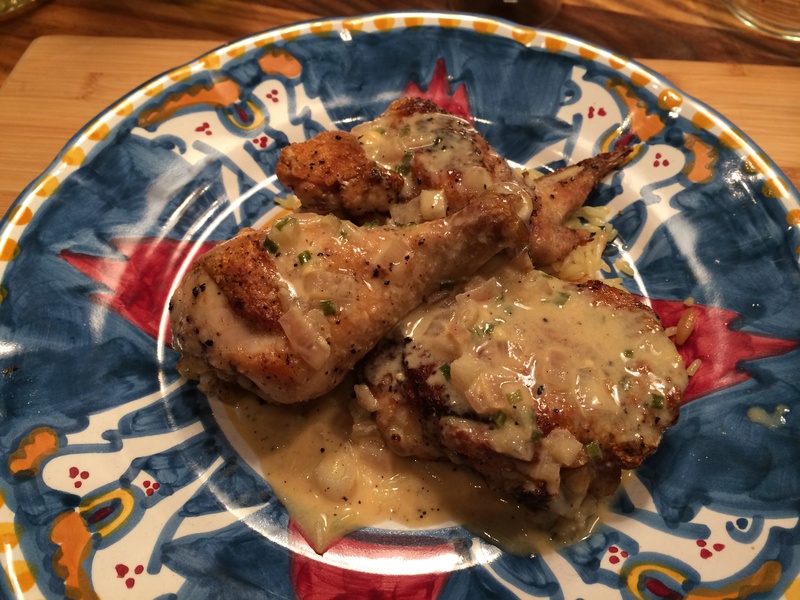 of chicken parts ( thighs, drumsticks, and/or breasts) with skin and bones . I used 1 lb. but this amount of sauce would be good for up to 3 lbs. Use whatever parts of chicken you prefer, but I have to say the thighs were delicious. Preheat the oven to 450 degrees with rack in middle. Heat oil in a ovenproof 12-inch heavy skillet ( Le Creuset) over medium-high heat until the oil shimmers. Working in 2 batches, brown chicken, skin side down first and turning once, cook until chicken is golden about 5 minutes on each side. If heat is turned too high it will burn oil so you may want to turn down and make adjustments depending on your stove. Return all chicken, skin side up to skillet and roast in the oven until just cooked through about 15-20 minutes. Transfer chicken to a platter , then add shallots, wine, and broth to pan juices in skillet and bring to a boil, scraping up all the brown bits with a wooden spoon, until sauce is reduced by about 1/2, this should take 2-3 minutes. Add cream and boil until sauce is slightly thickened, a few minutes. Strain sauce through a sieve into a bowl. Whisk in the mustard, chives/scallions Salt Salt and Pepper to Taste. 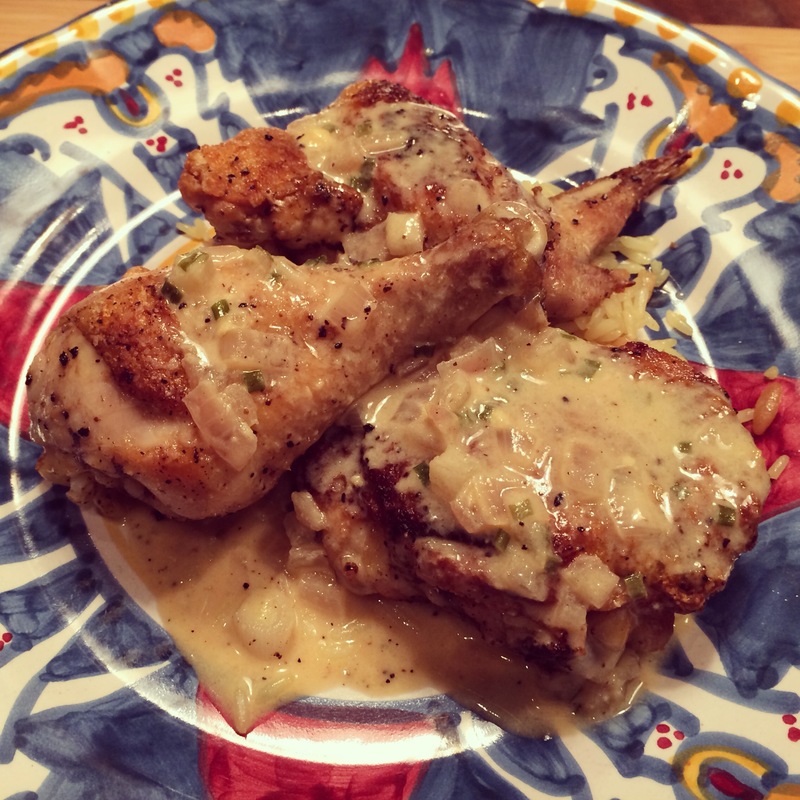 This entry was posted in chicken and tagged Chicken Thighs, chicken with dijon and shallots. Bookmark the permalink. Mmmm. This looks wonderful! Love the pan sauce, too!